Want to keep in the loop on the latest happenings at Chabad Russian Center. Subscribe to our mailing list below. We'll send you information that is fresh, relevant, and important to you and our local community. Hebrew School 12-23-18 Land of Israel Lecture with Ronnie Halibard Chanukah Funday at Hebrew School Bat Mitzvah Club Fair SIB Chanukah Family Festival Bat Mitzvah Club Fun 11/20/18 Hebrew School - Learning about Chanukah! Chassidic Pop Art Show - with Rabbi Yitzchok Moully Hebrew School AWESOMENESS! 11/11/18 Ultimate Birthday Bash at Hebrew School! Hebrew School Learning about Passover! Mommy & Me - Exploring the Color Yellow! Bat Mitzvah Club - Pre-Purim Fun! Hebrew School - Learning about Chanukah! Ultimate Birthday Bash at Hebrew School! Hebrew School - Getting Ready for Pesach! Hebrew School Mega Challah Bake! First Day of Hebrew School 2017! Hebrew School - Learning about Passover! Getting Ready for Passover at Hebrew School! Glow in the Dark Purim 2015! Purim Party at Hebrew School! 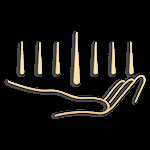 Hebrew School at Chabad RC! Book Club at Chabad RC - April Session! Art Class at Chabad RC! Hebrew School Learns about Pesach! Learning about Chanukah at Hebrew School!